Andrew Mills is Music Director at Old Saint Patrick Church in New Orleans. 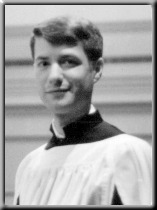 Previously he was Organist and Choirmaster at the Church of Saint Agnes, at Grand Central Station in New York City, where he played a 1998 Mander organ and conducted a professional choir for the weekly Latin Tridentine High Mass. He earned a Bachelor's degree in organ performance from the North Carolina School of the Arts, and a Master's degree in organ performance from The Catholic University of America in Washington DC, where for eight years he was Organist and Choirmaster at Saint Peter's Church on Capitol Hill.He has performed at such prestigious venues as the National Cathedral (Washington DC) and Saint Thomas Church (New York City).